CLICK TO SEE VIDEO https://www.youtube.com/watch?v=W7Gm1S1AjqQ Recommend Buyer Inspect item before BUY, as all sales are final (NO REFUNDS ) Items locally listed. Seller reserves right to cancel this listing upon local sale. Items in PCB Fl. contact Jim @ 850-481-6070 with questions. $ 500.00 due by PayPal immediately on sale and remainder by cash or Cashier check within 7 days of purchase. THIS IS A GOING OUT OF FISHING SALE-- Sale due to Open heart surgery and OLD age. All fishing gear SHOWN is included in sale. MAKE OFFER option is available.... Item includes fishing items shown in pictures, bait trap, radar (not presently mounted), Reels-Shimano,Penn,Electric, 4/0,6/0, Other reels, Davis, Shakespeare,other rods, Inshore rods and reels, too many to list. 6/8 oz. weights,hooks, spool lines, tackle boxes, Yozuri lures and many others,Ice chest , Smaller new reals(not shown) . Gaff, nets, Electric downriggers with weights, Outriggers, Windlass w/ 300 ft rope/30 ft chain/anchor. 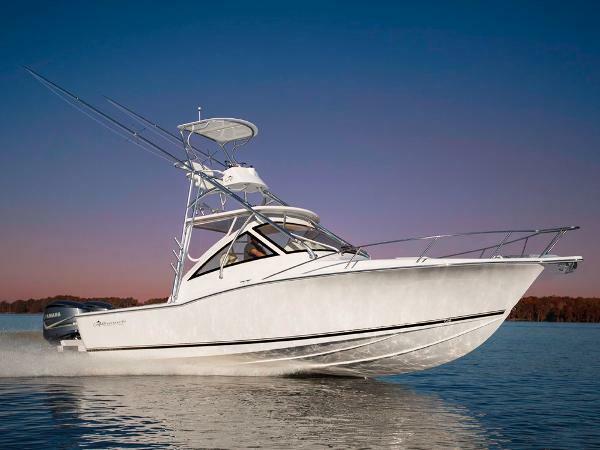 Lifejackets, belts, castnet, rod case, cushions, cleaning equipment, fenders, spare deck lines.Extra parts include new spare Marine antenna, new Trim tab actuator, Spare Complete 225 Honda Low/High pressure Injector system. All fishing related equip included. 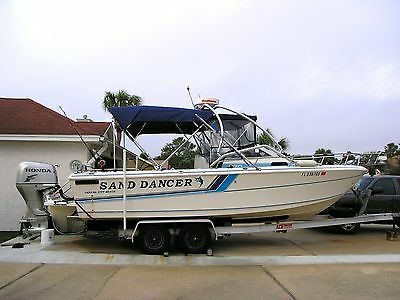 Engine has 1290 hours and has been personally maintained and fresh water washed after each trip. Trailer is tandem axle aluminum with radial tires. Original I/O Proline was reworked in 2007 with added Mahogany stringers, corner braces, and Armstrong bracket. 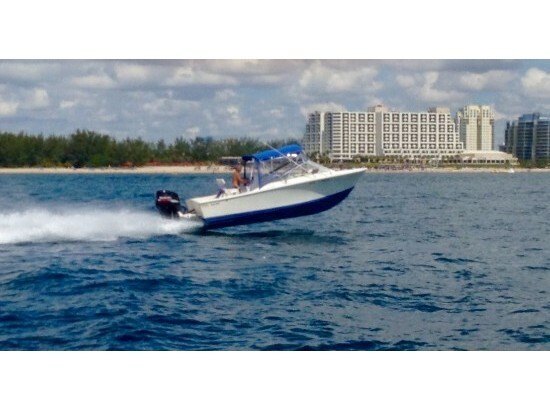 Honda was professionally installed by Gulf Marine. Radar tower has lights. Floor hatch contains Bilge pump/washdown pump/fuel filter /fuel flow sensor/battery switch for easy access. 2 ea Deep Cycle batteries. Cockpit has Humminbird Fish Finder and GPS with approx. 200 Waypoints from Apalachicola to Pensacola. GPS is hooked to Autopilot for punch and Go. Marine Radio, Fuel flow monitor, Dive ladder, Biminis and deck chairs, live wells, with new bolsters. 100 gal. main tank and built in 30 gal. aux tank with manual switch over for keeping Ethanol free fuel for keeping regular gas out of injectors during storage. Cabin has flat upholstered surface .Anchor locker contains independent deep cycle battery, charged via engine charging system. .All equip in Good fishing order. Clear original titles .Should be able to hook to a 2 in. ball and head for the Gulf. Local pickup only..... This system has performed well on 500 mile trips and has been fished regularly 50 miles offshore. I have described as well as I know the condition of this equipment. There are no guarantees and no refunds. Old salts will know this is a great opportunity, price and available equipment, with salt water always being a risk. Newbys to off shore need to know that salt is your enemy and fresh water and soap, Clorox are your friends. Feel free to come inspect and crank the old girl up. Be careful, there are a lot of Hussies with lipstick out there. Approx. $40,000 invested. Used 1290 hours, see Videos, click on : https://www.youtube.com/watch?v=W7Gm1S1AjqQ to view videos. Hell to get old, somebody else's time to have fun!!!!!!!! 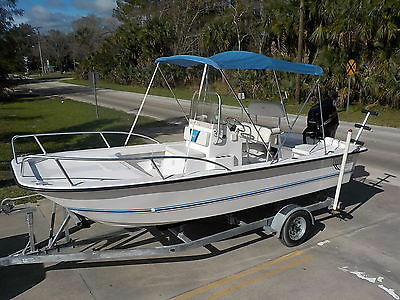 1995 Regulator 26’ Classic Twin 2004 225 Mercury Optimax with SS 3 blade Mirage Prop – approx. 700hours each Twin Mercury Smart Craft engine monitor gauges Top speed fully loaded 50 mph - cruise 40 mph The ride is super smooth and is extremely dry and stable Electronics: Garmin 5212 Touchscreen with GSD -22 Garmin 498 GPS/Depth finder with transom mounted transducer Garmin HD18 radar Airmar 1 kw thru hull transducer Locking Electronics box with Icom MC422 Marine Radio 8' Shakespeare antennae’s on swivel mount – 1 for radio and 1 for stereo Kenwood head unit with remote control on dash, JL Audio Marine Amp, JL Audio 7.7 Marine speakers and JL Audio 10” sub-woofer – has i-pod and i-phone connections 2 house batteries on Perko switch VSR relays installed to charge house batteries from motors New in Box Garmin GHP10 Auto Pilot with GHC20 monitor and 2.1 Liter pump (not installed) Power and fuel: Racor Fuel Water Separators 2 cranking batteries on Perko Switches 237 gal fuel tanks (161 main and 76 auxillary) Storage: T-Top life jacket storage bag with Velcro fast open strip (offshore life jackets included) Tons of Storage 3 fish boxes up front ( 2 @ 250qts. ea. 1 @ 720qts.) 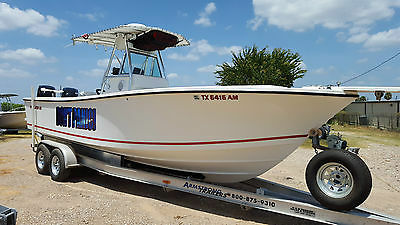 Rod storage in main front compartment Bow Storage/ Anchor locker 2 small dry storage lockers in deck midship Large locking dry storage area inside center console that can also serve as a head Ice chest/seat for drinks in front of console Storage in leaning post Space for removable ice chest under leaning post Fishing Amenities: T-Top with 4 rocket launchers 4 rocket launchers on leaning post seat back 4 rod holders on leaning post deck 2 rod holders on transom 4 rod holders on gunnels Padded coaming rails on transom and gunnels 40 gal live well in rear deck Saltwater wash down with coiled hose Rod holder bait table 3 bait boxes in transom Custom leaning post Lee Outriggers 18’ with rigging Macerator Pump for Fish Boxes Additional: Bow Dodger – like a tent for the bow – provides protection from weather or morning dew Sea Star Hydraulic steering Bennett Electric Trim Tabs with dash controls 4 Optronics LED spreader lights with independent switches Armstrong swim ladder for Armstrong bracket Bow Pulpit and anchor Scupper tubes have been fiber glassed in place Custom graphics for boat name, TX numbers, boot stripe and Regulator name Armstrong aluminum trailer with new tires, wheels and spare, new torsion axles (6,400lb axles), new aluminum bunks, new lights, new brakes and surge brake actuator, new brake lines, new tongue jack and guide-on posts (trailer rebuilt May 2015) Boat has been washed inside and out after every trip StaBil used in fuel with each tank Mercury Premium Plus oil used exclusively in motor All filters changed including cleaning the VST filter Super clean with tons of storage. 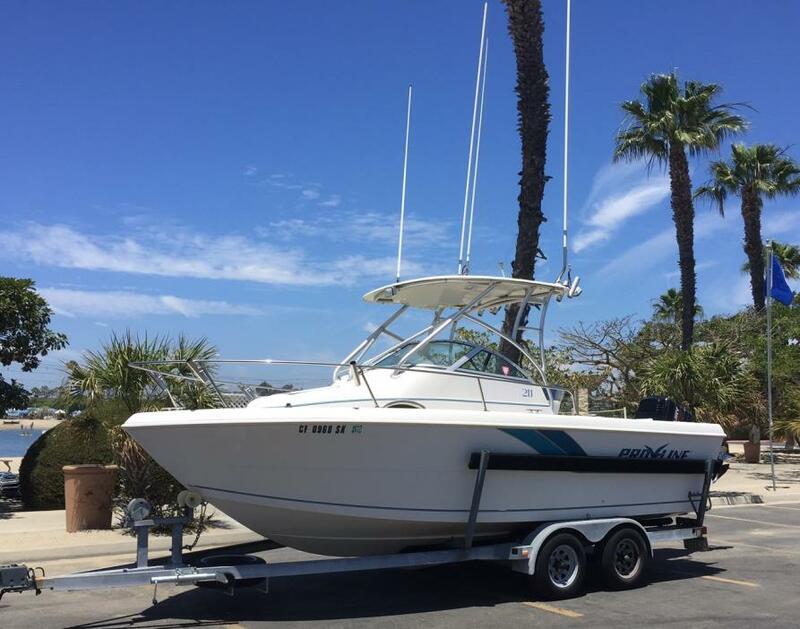 Boat is turn-key and ready to fish.